This is Dobby, my rescue GSD who is almost 2 years old. I have hunted high and low to find another bald shep but so far have found none! As far as I know he was born with a full coat apart from a small bald patch on his head. I have had him since he was 5 1/2 months old. He did have some hair along his back but it has almost all gone now. The official diagnosis of his condition is CDA (colour dillution alopecia) as well as inflammatory bowel disease. He is allergic to most animal proteins but as you can see he is fit and healthy. He is the most loveable, funny, energetic, crazy lunatic I have ever come across and I adore everything about him. 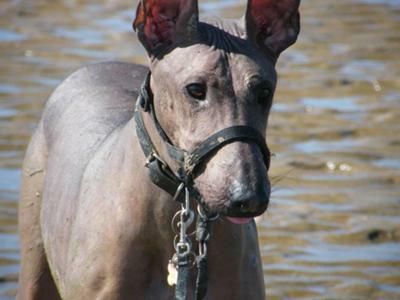 He looks very much like a peruvian hairless only much bigger (he weigh 42kg). I have seen CDA in other breeds such as dobermans but their coats just look sparse rather than completely bald. I would be very interested to know if anyone out there has ever come across this condition in this breed. Thanks so much for sharing the story of your wonderful, special and unique little fella. I have to admit, I thought I had seen just about everything German Shepherd wise, until you introduced us to Dobby. He is certainly my first bald German Shepherd! I am very familiar with loads of skin issues that German Shepherds have but have never seen anything to this degree. Concerning the alopecia and inflammatory bowel disease, does your vet have him on a certain diet and supplements? And do you use sun screen on his skin since he has no coat to speak of? I have a few friends with Chinese Cresteds (the almost completely bald ones) and they are constantly using sunscreen on their dogs. And just a suggestion, I am a firm believer on the use of herbal supplements and non medical (pills & the like), traditional medicine in the use of day to day treatments. If you happen to have a holistic vet in your area, or maybe even a pet friendly herb store, you may very well find a solution to your boy Dobbys condition and a treatment that may even help restore his coat - without all the usual side effects from regular meds. Thanks again for sharing your unique story. Comments for Is my boy the only bald German Shepherd on the planet? Wow! Dobby is a very striking dog. Do you have any more pictures online? You're a lucky parent! Hi Mel, I think your dog is absolutely magnificent! As long as the boldness isn't an indication that he has a disease process going on, who cares what caused it?! I wouldn't work too hard to try and restore it. He looks fantastic! Dobby is the first hairless shepherd I've every met. It was lovely to see him running on the beach with all the other shepherd's back in November. Wow. At last. Im so glad to hear of Roman and Mini. Would love to see some photos of them. Dobby is doing well and enjoying life just like any other dog. Its so good to know that Roman and Mini are happy and thriving too. I hope you find a good home for Mini. She sounds adorable. I whelped a litter of shepherds this summer. Out of a litter of 7 the 4th pup looked black and white in the sac. I almost had heart failure!! I knew the pups were purebreed shepherds for sure. This little female looked like a mouse! We nicknamed her Mini. I thought perhaps she wouldn't make it but she latched on and eventhough she was small, she was always first to feed and wouldn't let even the largest pup steal her spot!!! There is almost no hair on her underside. My vet has never seen anything like this. She is now 10 weeks old and is still here with us and her mom, her bullmastiff brother and a little boston sister. I am looking still for the right forever place for her but am VERY picky. Nice to know she is not the only hairless shepherd ever, yours is the only one I found after a lot of searching. I know of a "bald" German Shepherd by the name of Roman. He has some hair left in his face, but not much. He needs protection from the sun as well as the cold. In winter he wears a coat. He is allergic to just about anything and needs special dog food "Taste of the Wild". You're absolutely the luckiest GSD owner as he is a one of a kind...My boy, Duke, whom I rescued as well, would have so much fun playing with him!!! Kudos to you my friend, for making him a part of your life! Your boy is Precious!!! Not only he is Special, so are You for taking him and giving him a loving home. A lot of people wouldn't have but you did. There's probably not "bald" shepherds just that he has a condition, hopefully you can found someone to help but if not, this is what is to be, I'm glad you are there for him. He may look different from outside of a Shepherd but more importantly he is a German Shepherd on the Inside, with all same characteristics; Loyalty, Trustworthy and Protector! Take care of your boy and he will take of you too! Thanks for taking the time to read about my beautiful boy. Yes, he does need factor 50 when the sun is out! I have tried him on all sorts of different diets. We have now settled on fish for dogs which he has no adverse reactions to so all is well as it is easy to get hold of and isnt overly expensive. He is on a low dose of steroids at the moment but will definately look at the more natural alternatives as I dont want to keep him on steroids long term. Thanks again for your comments. Mel. Mel------------Thank you, thank you----for being toby's best friend. Many people would not have been so egar to keep him. We are all aware of what some kennels do when the dog doesn't measure up!! Again, thank you-you are a special guy with a more special PUP! Care for him here on this Earth and you will enter eternity with him always at your side. You are both special, THANK YOU!!! Is my boy the only bald Gernan Shepherd on the planet? Thank you for sharing your story about Dobby. He is such a precious, & special boy. I love his photo!